What a waste of time. The movie drags on. You keep watching expecting a big reveal but it never happens. Super super slow and not really scary. If you are looking to fall asleep in the theatre then this movie is for you. 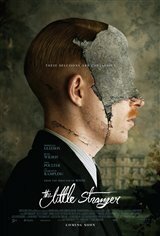 "The Little Stranger" is a quiet little thriller that masquerades as a ghost/horror film but is, in reality, a murder mystery. It keeps you guessing with fine performances by Domhnall Gleeson, Ruth Wilson and Charlotte Rampling. It has a couple of interesting plot twists. Go see it. Yeah for the British and Irish Film Makers for making dramatic films void of special effects, cartoonish acting and plots, excessive noise and loud annoying soundtracks. Artful film making without the crap!! !